Shot rapidly and affording all the more vitality and improvisational fireworks for it, Wong Kar-wai’s picaresque laudation to the most alluring heavy hearts in Hong Kong is nostalgic, rollicking, and constantly breaks new ground. This charming and comical chef d’oeuvre offers a romantic and cordial reverie in the tradition of Jean-Luc Godard’s Masculin Féminin (1966) and Pierrot Le Fou (1965) as personable young adults estimate their lovesick aches and irritations to pop songs and incidental toy airplanes. Shot entirely in sequence over a scant twenty-three days––during a hiatus in the middle of Wong’s wuxia epic, years in the making, Ashes of Time––the director wanted to fill this gap by making a quickie movie to restore his creative flow. Starting with little more than a sketch of an idea, a few coherent characters and some very specific locations, the plot and the nitty-gritty would all emerge when the filming began. That was the plan. Wong’s desire and propensity to work without a script supplied Chungking Express with some sublimely cockeyed cadences and idiosyncrasies. The film would organically grow into an often beautiful and responsive work, challenging and tender, that would stand as a attestation to his trust and choice in cast and creative collaborators. Chungking Express charmingly introduces us to the daily routine of Cop 223 (Takeshi Kaneshiro, excellent), as he obsessively purchases a can of pineapples with the expiration date of May 1. This date resonates with Cop 223, for that represents the day he has decided he will get over his lost love and acquire a new one. Simultaneously his wandering eye has found a mysterious woman in a blond wig (Brigitte Lin in a now iconic turn), who just so happens to be a big player in the drug underworld. The other story in the film concerns forlorn Cop 663 (wonderfully played by Wong regular Tony Leung Chiu Wai), heartsick after an emotional breakup. 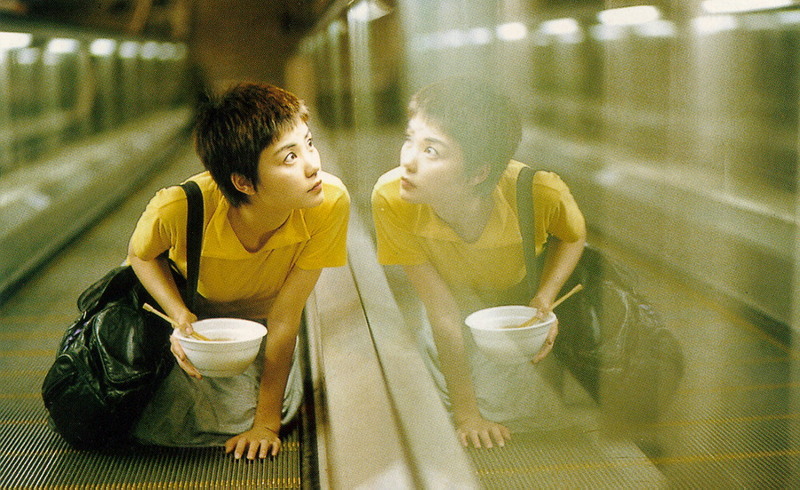 When Cop 663’s ex leaves a letter and spare set of keys at a local snack bar, a quirky young waitress (Cantonese pop superstar Faye Wong, delightful) decides to let herself into his apartment at regular intervals with the intentions of stealthily improving his life. The two barely related and utterly offbeat love stories in Chungking Express share spurned and lonely policeman and the bright and bustling urban hub of Hong Kong for a setting. In the Takeshi Kaneshiro/Brigitte Lin story there’s more of that hard-boiled pot-boiler approach, albeit very unconventional and while danger lurks for these sweethearts, it’s on the batty periphery. That the new woman in Cop 223’s life is a drug dealer unbeknownst to him has an almost screwball aesthetic. Both of these parallel stories are as playful and light on their feet as they are strangely fascinating. But one could argue that the real star of Chungking Express is not to be found in the wonderful actors nor the digressive and delightful story. No, it might just be that the real draw here is Hong Kong. Wong Kar-wai and his regular cinematographer Christopher Doyle, take pains to transform Hong Kong into an inebriating blur of lustrous neon, and inchoate images. Doyle and Wong seems to delight in fiddling with film stock, exposure, and camera speed, lending Chungking Express an urgency and a spur-of-the-moment vibe ensuring that anything can happen, and all at an unpredictable clip. The handheld flourishes also add a real sense of urgency and abutment to the proceedings. Ably assisted by Wong’s signature understanding of the power of pop music, namely the Mamas and the Papas’ left field hit “California Dreamin’” (but also an eclectic variety of contemporary and standard pop classics like Faye Wong’s renditions of “Dreamlover”, her cover of the Cranberries’ “Dreams”, and Dinah Washington’s “What a Difference a Day Made” amongst them). This thematically vital and stylistically sententious use of music unveils Wong’s pop sensibilities, similar to his Western contemporaries like Jim Jarmusch, Martin Scorsese, and Quentin Tarantino whose musical savvy adds great heft and effect to their distinctive work. At the time, in the mid-90s, Chungking Express would become Wong Kar-wai’s most celebrated international success. Not only would it launch Christopher Doyle into the upper echelon of cinematographers it would also make Brigitte Lin’s blond locks, dark sunglasses, and zero-fucks-to-give attitude a contemporary icon. In the post-Chungking Express landscape Wong Kar-wai became an immediately acknowledged style signifying a relaxed narrative with a poetic structure, splashes of bright color, erratic and funny voice-overs, energizing camerawork––often handheld––and awesomely unusual framing. There was a new romance, one of revision and cognizance set in cities like Hong Kong, where change is constant, bereft of history perhaps, with ever wavering thoughts and ideas. Sophisticated cinema, metropolitan and maudlin, and proud to be just that.